Having a cup of coffee in the morning used to be just that, but lately I've been craving something sweet to go with my French roast. Instead of the usual cookie or Luna bar, this week I decided to try out a coffee cake recipe I've been sitting on for awhile. 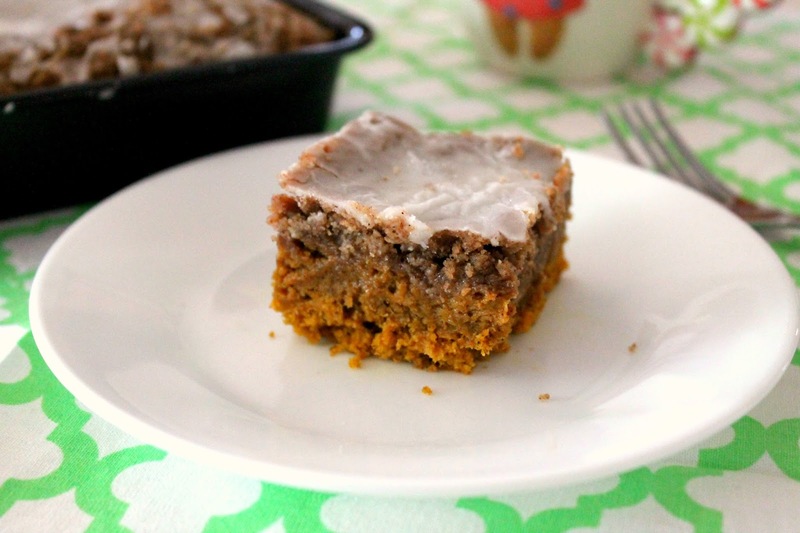 It's got a cinnamon streusel topping (which pairs well with coffee) below a thin layer of sweet icing that almost makes it feel like dessert. I'm thinking it'll be a great alternative to pie this Thanksgiving. Preheat oven to 350° and spray a 9x9 baking pan with nonstick spray. Start by making the streusel; mix flour, brown sugar, salt, and cinnamon until well combined, then cut in cold butter and mix with fork to create a crumby consistency. In a large bowl whisk together flour, baking soda, baking powder, salt, cinnamon, and pumpkin pie spice. In a separate bowl, mix pumpkin puree, brown sugar, vegetable oil, maple syrup, and milk until well combined. Add wet ingredients to the dry ingredients, and mix until just combined (the batter will be thick but don't overmix it). Spread batter into prepared pan, then top with streusel, pressing it down slightly into batter. Bake for 30 minutes. The cake is done when a toothpick inserted in the middle comes out clean with just a couple of crumbs. While the cake is baking, whisk confectioners' sugar and milk to make the icing. You can add more milk if you want a thinner icing. Drizzle over cake. 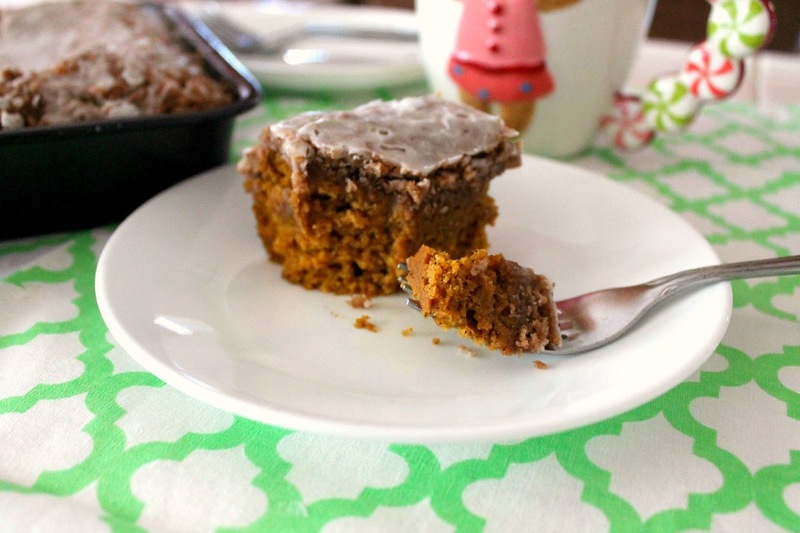 This cake is amazing served warm with a cup of strong coffee. Enjoy! 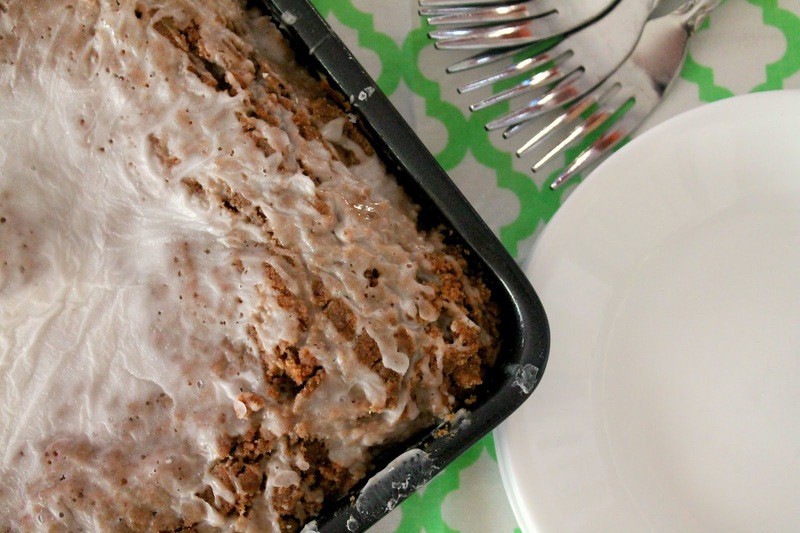 I LOVE coffee cake, so I can only imagine how insanely good this it - yum! !